The Passover of the Jews was near, and Jesus went up to Jerusalem. In the temple he found people selling cattle, sheep, and doves, and the money changers seated at their tables. Making a whip of cords, he drove all of them out of the temple, both the sheep and the cattle. He also poured out the coins of the money changers and overturned their tables. He told those who were selling the doves, “Take these things out of here! Stop making my Father’s house a marketplace!” His disciples remembered that it was written, “Zeal for your house will consume me.” The Jews then said to him, “What sign can you show us for doing this?” Jesus answered them, “Destroy this temple, and in three days I will raise it up.” The Jews then said, “This temple has been under construction for forty-six years, and will you raise it up in three days?” But he was speaking of the temple of his body. After he was raised from the dead, his disciples remembered that he had said this; and they believed the scripture and the word that Jesus had spoken. John 2: 13-22. Few paths offer a quicker road to trouble than criticizing someone’s religion or their politics. Almost certainly, Jesus knew that about us, and travelling down that road got Him killed. In today’s reading from the Lectionary, Jesus criticized both the religion and the politics of the Judean authorities of that time. The Temple stood as a monument to something sacred and holy: it represented the intersection of heaven and earth, the dwelling place of the Living God, and a visible symbol of both national identity and God’s covenant with the Jewish people. Most people would perceive an attack on the Temple as an attack on the faith (and the nation) itself. These events took place as the city of Jerusalem swelled with the Passover crowds. All four Gospels record this event, one of the few occasions on which Jesus became deeply angry. 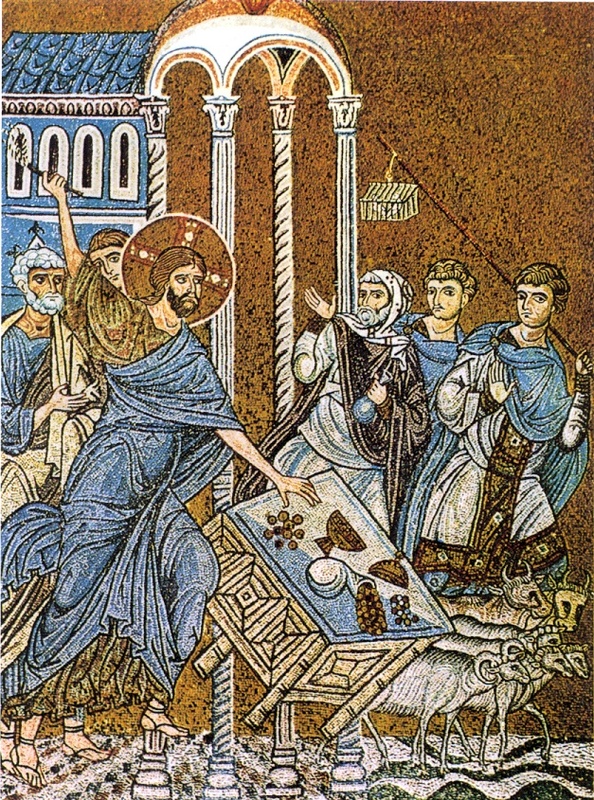 In the other three Gospels, Jesus calls the Temple a “den of thieves.” John places this event near the beginning of Jesus’ public ministry, as opposed to the synoptic Gospels which place it much later. Jesus apparently became enraged upon observing the barriers thrown up by the priestly authorities, barriers which stood between God and His people. For example, because Roman coins were forbidden in the Temple, they had to be exchanged (at a substantial discount) for the currency of the Temple. The Temple authorities also collaborated with the Roman occupation, and Jesus overturned that table as well. In John’s Gospel, Jesus insults the Temple culture, calling it a “marketplace.” Trading on access to the Holy was then, and still remains, a special kind of blasphemy. Jesus became enraged when He saw the Sacred being traded like a commodity. I think we underestimate the Gospel if we see this as a historical criticism of “the Jews” back then. Our churches still seek to collaborate with political power. We still fall under the thrall of a purity system that separates the righteous from the sinners, the holy from the impure and the whole from those who are broken. We might well examine the ways in which we still place obstacles in the paths of those who come looking for God. We might wonder whether our churches, like the Temple in Jesus’ time, have become comfortable monuments to the status quo. We might ask whether our houses of worship have become mutual admiration societies rather than instruments of change. Perhaps we should share the Savior’s sense of outrage when we encounter it. The Judean authorities asked Jesus to provide them with a sign (seimeion), in other words, to show them the authority by which Jesus issues this prophetic condemnation. Asked for an explanation, Jesus replies with an enigma. Jesus responds that upon the destruction of “this temple”, he will raise it up in three days. As is so often the case in John’s Gospel, Jesus is misunderstood. (We find the classic example of this in Jesus’ trial as Pilate questions Him. John 18, 19.) Jesus speaks of the sanctuary of His body; the Judeans think He’s talking about the architecture. Ultimately, Jesus will displace the Temple as the intersection of heaven and earth. As He told the Samaritan woman only two chapters later, “the hour is coming when you will worship the Father neither on this mountain nor in Jerusalem.” John 4:21. Further, Jesus’ death would signal the final sacrifice, rendering the Temple culture obsolete. Jesus thus appropriates the functions of the Temple for Himself. The life of Christ would come to operate as the new meeting place for those seeking El Shaddai (God Almighty). Like the Temple culture of Jesus’ time, many of us would still prefer a God we could do business with (see here). Jesus offers us something radically different: He offers Himself. He becomes the locus point (the alpha and the omega) where human history intersects with the Father. He has been raised as the new edifice where we can encounter the holy. As we come to this new Temple, Jesus doesn’t expect us to bring a dove or to engage in some special ritual. He asks us to take the whip into our own hands, and chase away everything that separates us from God. He asks us to come and offer ourselves, our whole lives, without reservation. He asks us to take up our cross and follow Him.